The American Farm Bureau Foundation for Agriculture has announced the winning teams in its fall Purple Plow Challenge, Cattle Ranch Riddle. The following teams were selected as the winners in this national competition: 1. Meadow Groves Farms, Charles R Drew Middle School in Lincoln, Alabama. Educator - Hannah McBurnett. 2. White River Valley FFA, White River Valley High School in Switz City, Indiana. Educator - Sam Zuckschwerdt. 3. Girls STEM Team, Brooks County Middle School in Quitman, Georgia. Educator - Christine Hiers. 4. Circle G Ranch, Rosalia School District in Rosalia, Washington state. Educator - Jodi Heitstuman. The Girls STEM Team, Brooks Co. Middle School was comprised of BCMS ECHOES students. The students participated in the contest as part of their ECHOES STEM enrichment. Before beginning their project Kurt Childers, Brooks Co. Farm Bureau President and owner of Bar C Cattle Co., spoke with the students about raising cattle, as well as what is required to produce a quality product, how to set up and manage a cattle farm, and how to maintain a budget for costs of production. For this contest, students constructed a model of a cattle ranch that addressed production as well as environmental, economic and societal needs. The project is on display at the Brooks Co. Farm Bureau office. We are very proud of our students and congratulate them on their accomplishment in winning a national competition. 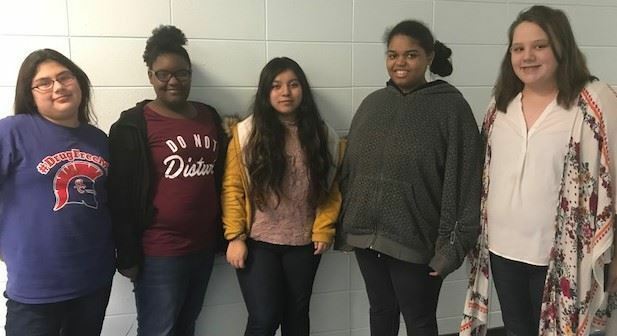 Pictured left to right; Yeilen Roblero Garcia, Aniyah Arnold, Esmeralda Lima, Tatania Martin, and Mary Beth Lasseter.